Aluminium door and window furniture is most commonly seen in offices, schools and low-cost housing. For such a strong and versatile material, aluminium is extremely cost-effective and is increasingly being produced in more appealing designs. 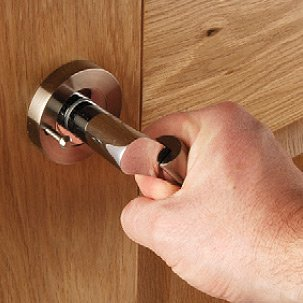 Door handles may be on a rectangular or curved backplate or a large square backplate which can be a practical choice when old door fixings need to be hidden. Handles on rose are also a popular option and the more designer styles can look very attractive on smart office doors. Aluminium door and window furniture is probably most often seen with a satin (matt) finish, but can also be produced with a shiny or coloured finish. Pull handles, push plates and kick plates made of aluminium are very practical and inexpensive and therefore particularly suitable for use in schools and colleges and other applications where cost is a necessary consideration.